PCBack allows you to set a custom background that users will see when they private chat you. NOTE: If you use a default avatar, anything after the numbers will disappear and your avatar will be your PCBack. If you have an animated avatar, PCBack won't work. Simply add a second or third avatar link preceded by #. I.e. click on your name and add avatar1#avatar2#avatar3 in the “Picture” section. The first avatar will be the avatar used when you speak in the chat, the second one will be used for the background when users private chat you, and the third one will optionally be used for the background when friends private chat you. Note: The third avatar only applies if the friend has added you back. They can all be the same or different depending on what you prefer. If you do not have a second and third link, your PC background will remain your current avatar link. This does not apply to users who use a smiley code for their avatar. If you use a default avatar or an avatar with a link, it will be your PCBack if you haven't set one. 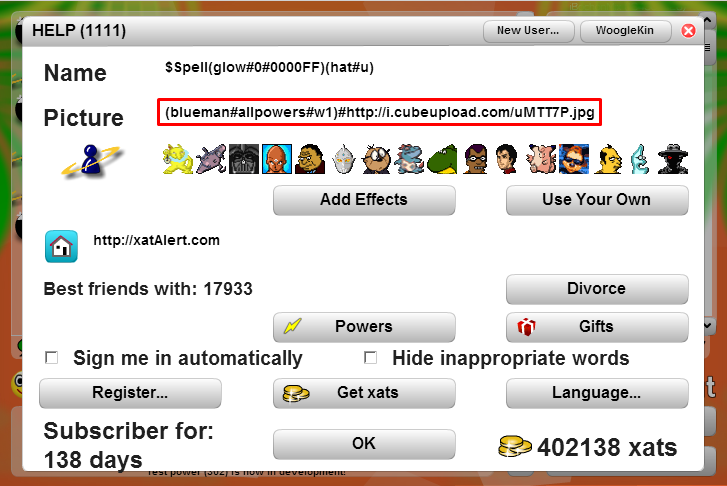 If you wish to use a default avatar and use a PCBack visit the avatars article and find the avatar you want. The maximum character limit is 128 characters. This is commonly surpassed by ImageShack and Photobucket. This causes your background to appear white or not show up at all. It is recommended that you use https://imgur.com or https://cubeupload.com for both your avatar (if it is not a smiley) and your PCBack to prevent this. If you private chat a user that does not own the PCBack power, you will instead see your own PCBack.